It's day 2 of my Embellished Events card class. I am always inspired by cards I see posted by other demos. Today's card is a case of one originally done by Mary Fish. I changed up the colors and embellishments to make it my own. I love using the Pool Party card stock on this one. 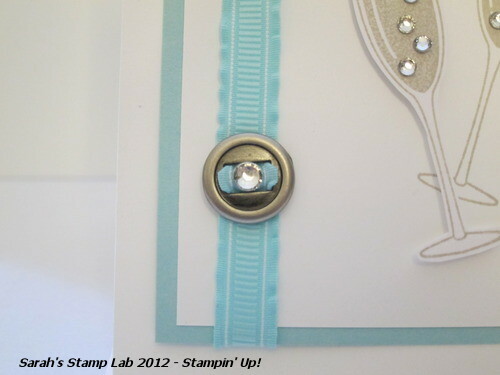 It's the perfect shade of "Tiffany" blue and is great for something blue on a wedding card. Sahara Sand is such a perfect champagne color and I really need to use it more often! Here's a close up of the new ribbon slides in the Holiday catalog. They are a really fun embellishment for your cards and projects! Want to see Day 1? Click here! This is lovely, Sarah! 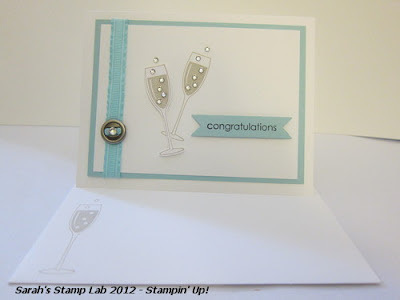 That blue really is perfect for a wedding card, and I love your glasses of "bubbly". Loving that ribbon slider, too. Wow!